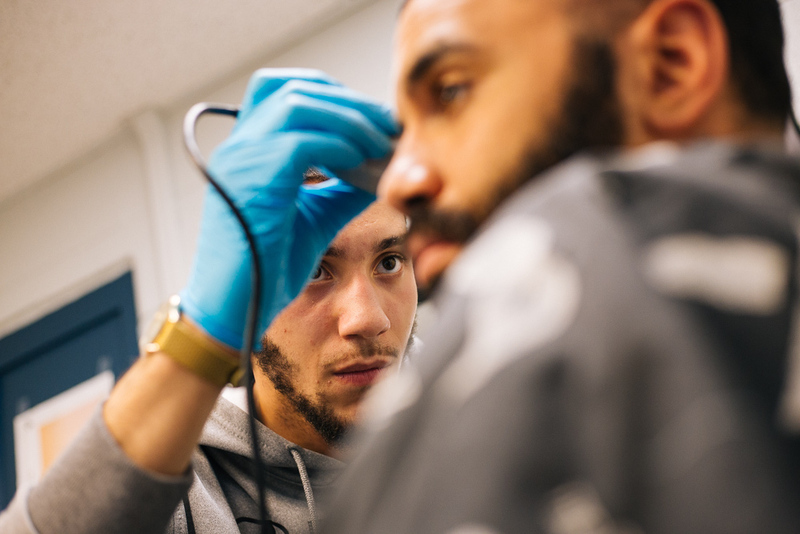 On Friday afternoons and other days on demand, senior Mark Loving III opens an informal barbershop in his campus apartment at Eastern Mennonite University. Guys and a few girls, too, line up for a fresh look for the weekend, issued with the staple of joking, gossip, wisdom and counsel. Soon, though, he’ll perform his craft in a proper barber’s chair with a proper mirror in EMU’s newest student space. Modeled after a barbershop and salon and dubbed “The Royal Treatment,” the space will be managed by the Black Student Union (BSU). Scott Eyre, lead residence director, jokes with senior Jess Washingon, secretary of Black Student Union, and Celeste Thomas, director of multicultural student services. Jourdyn Friend, BSU vice president, is not shown. The grand opening of “The Royal Treatment” – which includes two barber’s chairs, a hairwashing station, television and two comfortable couches, all enlivened by a bright wall mural celebrating African and African-American culture – was Monday, Jan. 21, at 11:45 a.m. during the university’s Martin Luther King, Jr. Day celebration. The ceremonial ribbon-cutting was followed by a barbershop talk with local barber Tyrone Sprague. During past MLK Days, a visit to Sprague’s downtown barbershop for some history, legend and lore was a much-loved EMU tradition. For the sneak preview hangout last week, though, it was Loving who did the barbering honors in front of a group of student-representatives from BSU and Latino Student Alliance invited by Thomas and lead residence director Scott Eyre. 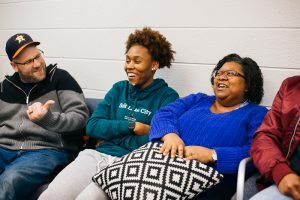 Both Thomas and Eyre sit on EMU’s Committee on Diversity and Inclusion (CODI), a 17-strong group that advises, consults and educates the EMU community. 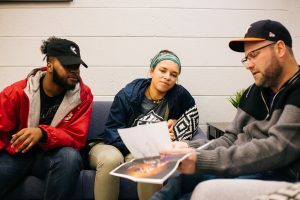 Black Student Union co-president Jakiran Richardson and Latino Student Alliance co-president Ariel Barbosa look at artwork for the mural with Scott Eyre, lead residence director. Erick Camodeca, associate cross country and track and field coach, took advantage of the preview to relax in the barber’s chair while getting a “temp fade” from Loving. Also a member of CODI, Camodeca might be new to the campus – he arrived last summer – but his experience at four other universities has given him a critical eye. A measure of support for the room was the wild success of its crowdfunding campaign. More than $2,600 was raised by donors to purchase sinks, chairs and other amenities and decorations. Historically, the African American barbershop and salon was, and still is, a meeting place, “a place where mothers take daughters, where fathers take sons, a family place, a place of confidentiality and gossip, with people coming in and out, selling this and that,” Thomas said. Senior DeVantae Dews, who served in leadership of Black Student Union for three years, talks about how plans for the new lounge began. The barbershop was also a place where “planning happened through the Jim Crow era and the civil rights movement,” Thomas said. “It’s still definitely a place where dreams are fostered,” said former BSU co-president DeVantae Dews. Dews found Sprague’s barbershop downtown when he first arrived from Lynchburg as a first-year student. Over the years, time spent with Sprague reflecting on the civil rights and Black Lives Matter movements, along with a host of other topics, were important to his own outlook and activism. Eyre, the residence director, appreciates the new space as an opportunity to learn about and appreciate cultures different from one’s own. The barbershop and salon is rooted in his own learning experience, which began when female students using hair straighteners in the dorms repeatedly set off fire alarms. Barber Mark Loving finishes up a cut for Coach Erick Camodeca. 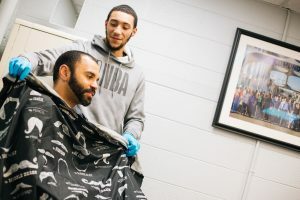 The barbershop and salon will be a familiar cultural space to many African American students, he said, but white students “will have to figure out how they fit in,” a fair experience considering that African American and minority students make that effort constantly at EMU, he said. The cozy room in University Commons is located in a former office donated by the Student Government Association. Students at the sneak preview event said they were confident the space would quickly become a campus hangout. I love this. Thank you for all of the leadership that made this happen.